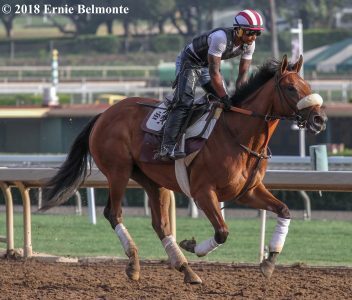 A field of ten 2-year-old fillies will race 6 furlongs in the 33rd running of the $200,000 Sorrento Stakes (GII) at Del Mar on Sunday — a race which serves as the traditional prep for the Del Mar Debutante Stakes (GI) on Sept. 1. Hall of Fame trainer Bob Baffert put his ownership stamp on the race a long time ago, saddling Soviet Sojourn to victory in 1991 and adding six more — Batroyale (1995), Silverbulletday (1998), Chilukki (1999), Inspiring (2004), Executiveprivilege (2012) and Pretty N Cool (2015) — but goes without a runner in here, leaving the event to mostly trainers who have never even saddled a runner in the race. This race was contested at 6 ½ furlongs for years, from 1993 until last year, but with the California racing calendar having changed so much with the loss of Hollywood Park and the fact that Santa Anita ran no juvenile races, Del Mar thought it best to offer this race at a shorter distance since it’s a good bet not many babies are ready. Now back at three-quarters of a mile, the distance is now a logical distance step to the Debutante’s seven furlongs. The early favorite is the maiden Bellafina from owner Kaleem Shah and trainer Simon Callaghan. The $800,000 daughter of Quality Road was second in her only outing at Los Alamitos a month ago, but the way she ran for that second was a little green, leaving many to believe she should graduate to winner and graded stakes winner in one fell swoop. She picks up blinkers and jockey Flavien Prat returns and she’s been training well here for a couple of weeks. Lady Lucy, who broke her maiden in her second start at Churchill Downs, makes her California debut for trainer Phil D’Amato after selling for $200,000 at the Fasig-Tipton Kentucky Horses of Racing Age Sale and her first start in nearly two months. The daughter of Into Mischief has been training exceptionally well since arriving in California and will have Martin Garcia aboard for the first time. Summerland, who is undefeated in her only two starts at Hastings Park north of the border including the Spaghetti Mouse Stakes, has earned figures that put her square in the running for top honors here. Hot jockey Tyler Baze will be aboard the daughter of He’s Tops and they will for sure be headed right to the front from the break. If she runs back to her last, which was at this distance, she’ll be tough. Bellafina (photo by Ernie Belmonte). Wesley Ward, who saddled Sunset Glow to victory in here in 2014, will tighten the girth on Keeneland maiden winner Dragic. The Broken Vow filly hasn’t raced since that debut 3 ½ months ago, but has been training steadily since late June and has a nice work here a week ago. 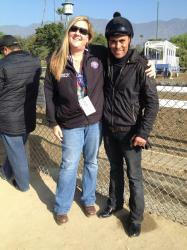 Jockey Rafael Bejarano will certainly be sending from the rail. One (of two) trainers who has won this race in the past is Doug O’Neill, who saddles recent maiden winner Dichotomy, making her first start against other winners (well, some are winners) and in open company after starting twice against fellow California-breds and winning here last out on opening day. She has a good, off-the-pace style in this field, which looks loaded with speed and likes this racetrack. Eclipse Thoroughbred Partners’ Stirred makes her stakes debut after breaking her maiden in her first start at Santa Anita back in mid-June. She’s got room to improve, will have hot jockey Drayden VanDyke aboard and the Mike McCarthy-trained daughter of Shakin It Up has shown a later-closing style, which will only help in this race with a predicted hot early pace. Madison’s Quarters broke her maiden at first asking in wire-to-wire fashion three weeks ago at Arlington Park, yet didn’t break any records in the speed figure department. The Ian Wilkes-trained daughter of Fed Biz gets the benefit of Mike Smith, and the inside post position is winning at a nice 18 percent clip so far this meet. Boujie Girl looked tremendous winning in her debut at Del Mar 10 days ago. This is fast back for a young horse, but she’s probably fit and could benefit from her experience over this surface. Giovanni Franco rides for the first time for trainer Peter Miller. Reflect is another filly who will likely enjoy the expected hot early pace as in her only race — a winning effort — she closed strongly to draw away by 5 ¾. She carries the potent combo of Keith and Kent Desormeaux, as well as some good works, including a nice gate effort last weekend. Del Mar My is still a maiden, but her debut effort was a tremendous one in that she finished behind the highly regarded Brill. If she duplicates that, she’ll likely still be a maiden, but she will likely be a graded-stakes-placed maiden. The Sorrento is Sunday’s eighth race at Del Mar with a post time of 5:33 p.m. PT.